Van storage can be a bit of a nightmare, right? You’ve got your tools, tool boxes and materials rumbling around in there. You arrive at your job, open your boot door and there lies a fright of overturned tool boxes, nuts and bolts scattered everywhere and those precious materials have buried everything. You sigh, stand there bemused and frustrated thinking ‘All I want is an easy life and an organised van!’ Back to reality and you find yourself clambering in the van, squeezing through tight spaces trying to reach what you need to get on with the job. Wouldn’t it be good to simply get to that toolbox knowing that all the tools and fixings needed are stored safely inside and you can comfortably transport it out of the van to your job? Or even better, a variety of toolboxes that stack together? What you need is Box on Box. 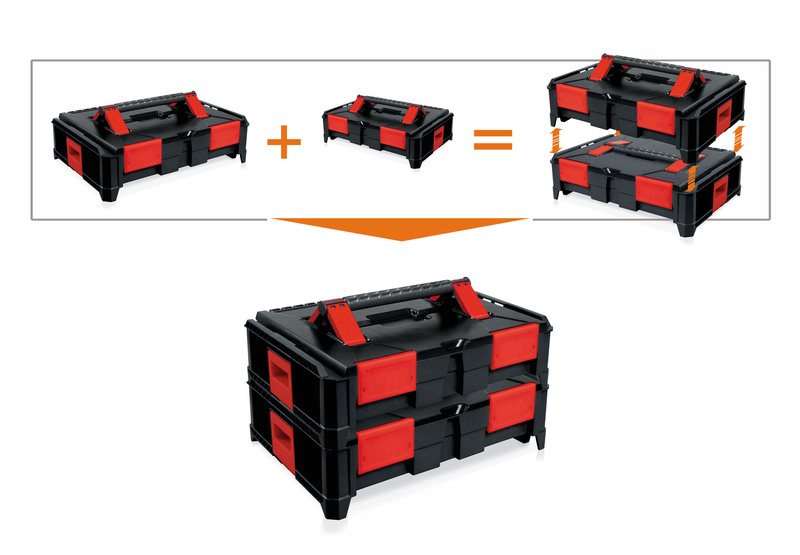 The Box on Box range centres on three main tool boxes, small, medium and large. Each box can be bought separately, or all 3 together as one complete item (SMKIT-A). The small case is brilliant for if you just need to take a few items on a job as it is easily portable. 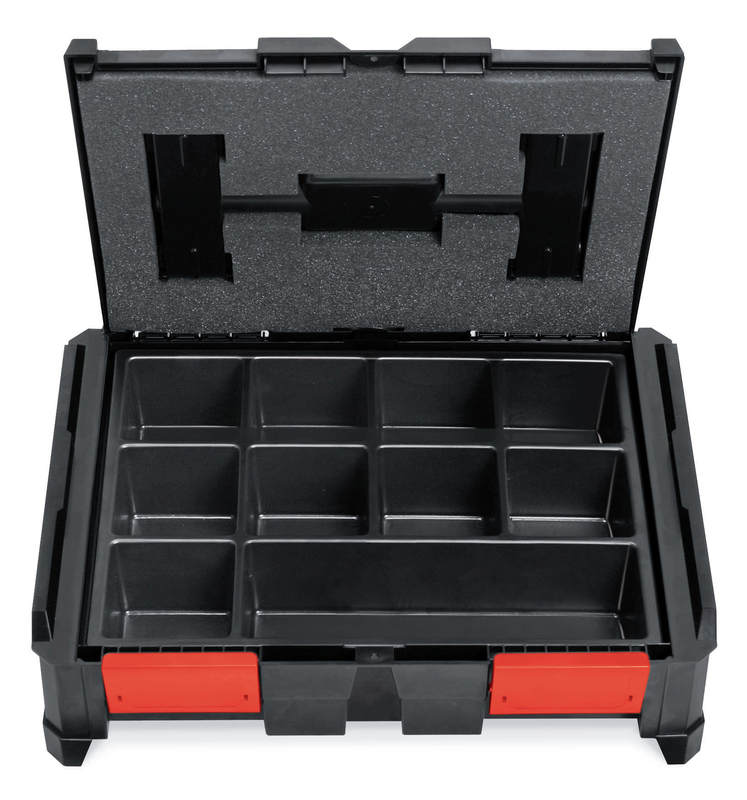 The medium case is great for fitting your day-to-day tools such as hammers, pliers, crimpers, cutters, tape measures, torpedo levels and hex key sets. The largest case is the deepest case, ideal for larger items like power tools and laser levels. A range of inners for the small toolbox can be bought separately. Each inner has different size divisional compartments for small items such as drill bits fixings and small parts. If you need to protect certain items that are fragile, we also have a range of fitted foams for both the base and the lid of the small case. When the foam is placed in the lid, it can stop items moving & mixing up in the dividers. If you’re not happy with purchasing fixed inners, the blister pack and pick boxes could be the choice for you. Pick boxes are different sized compartments, they are sold separately so that you can pick and choose what sizes you need and where you’d like to put it on the anchoring mat. The pick boxes simply click into the anchoring mat. They can be added and removed so you’re not stuck with a fixed layout. This is used in conjunction with the smaller case. Alongside this, you can buy tool panels which slot into the case upright. These tool panels have stitched elasticated bands which can secure smaller tools in place so they are easy to find at a glance instead of in a heap in the tool case. When all three cases are stacked up with tools in, they will be quite heavy and hard to transport in one go. 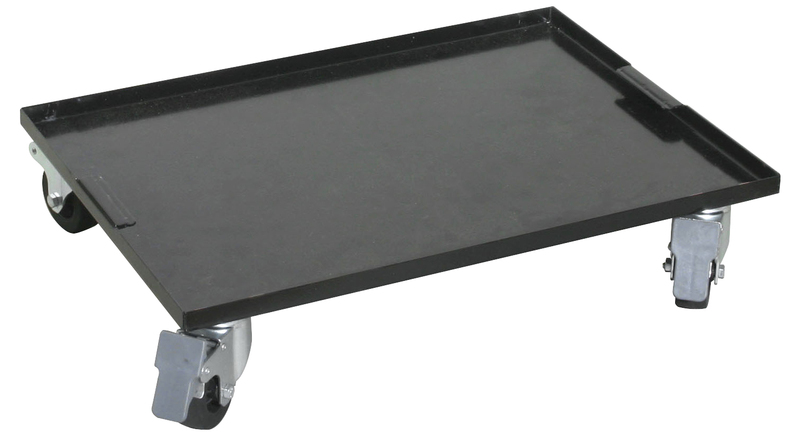 We offer a metal plate with wheels on. You simply slot the tool cases onto the plate, they will lock in place and then you can easily move the tool cases without harming your health. How do they stack then? The boxes have a patented stacking system whereby the four conical feet on the top case are guided into the top of the bottom case. Then *click* the boxes are locked together. This is a similar action to that of a magnet. The boxes can be stacked in any order. 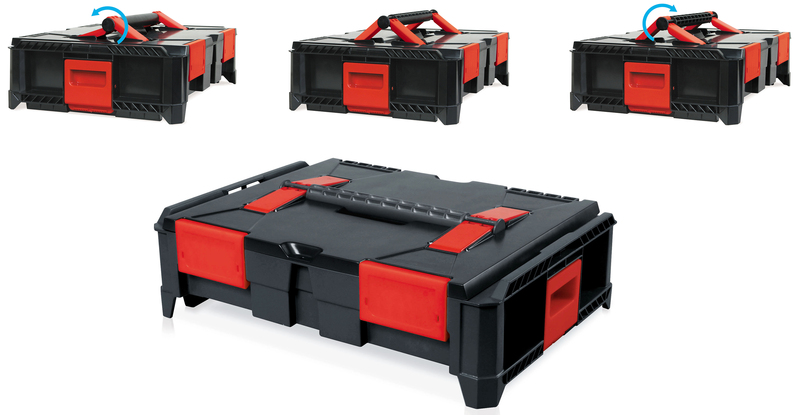 Unlike other tool cases, there are no sharp edges to the cases which could catch or break off. The cases themselves are made from strong, shockproof ABS plastic which have been put through vigorous tests to ensure the Box remains functional and strong, whatever it may be put through. 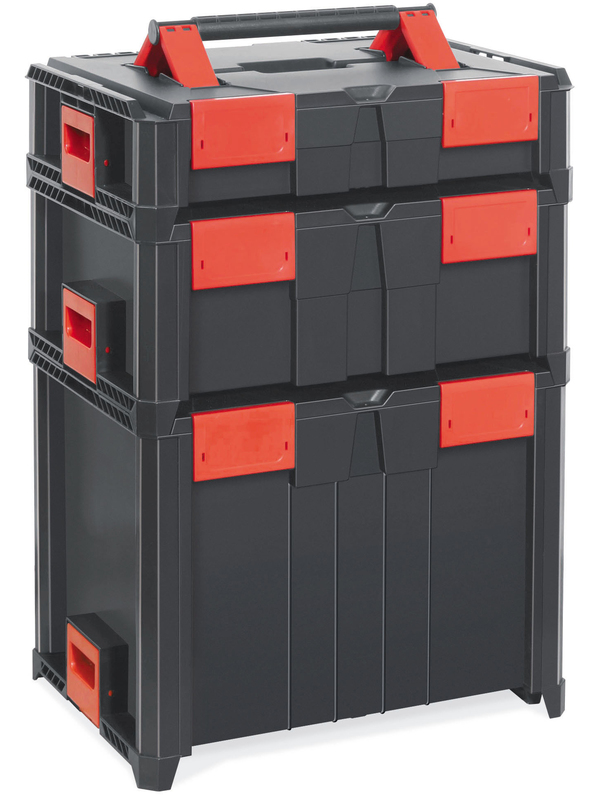 Because the tool cases are not fixed and have the stacking system, they can be rotated 180˚ so can open whichever side you need it to open. How can the handle support all the weight? There is a strong construction lid which has eight fixed points for the handle alongside strong hinges and two front locks with six heavy hooks. The handle has also be designed so that it slides on rails, this means however you hold the box, the handle will adapt, by moving, giving an equal distribution of weight. The handle also has the benefit of folding down and sits flush in the box. These are just some products that are in the range, to see more great products or to look at the features listed here in more detail, click here. Get organised. Get it sorted. Get Box on Box.